: 90 à 110 cm. 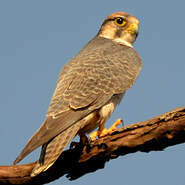 Falcons (from latin falco, falconis, who has nails in the shape of a scythe) are small birds of prey. Beak is short and bended from the base. 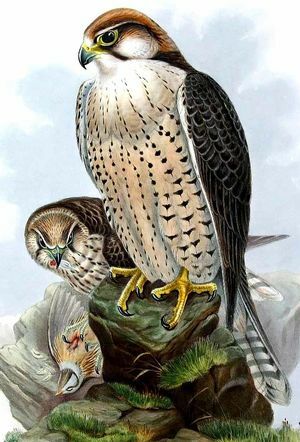 Lanner falcons have a similar size to the Peregrine Falcon, but have a paler coloration. Their tail is longer and their wings are less pointed. Their appearance is svelter and they fly with a less powerful wings beat. Head cap looks like a reddish hood and forehead is white. A slim black moustache appears across the cheeks, just under the dark iris. Orbital circle is pale. Beak is greyish blue. Back is uniformly slate grey, showing little contrast with their rather pale belly. This one has a dominant creamy white or reddish color. 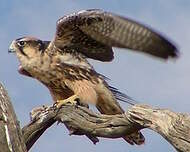 Lanner Falcons are divided into Feldeggi breed in Europe and Erlangeri breed, in North Africa. The latter is a bit smaller, with less spotted and paler underparts, and a darker grey back. 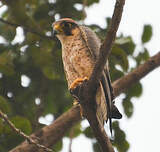 Juveniles of both breeds are much slimmer, with a brownish back and dark streaked underparts. 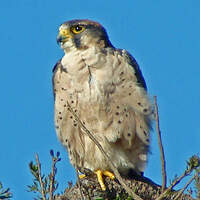 Lanner falcons live on African seashores as well as in continental areas, from Mauritania to Egypt. 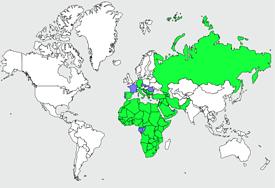 It can be found also in Italy, BAlkanic peninsula, Turkey and Asia Minor in its whole. 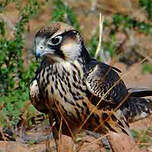 In Africa, it nests in semi desertic areas of Moroccan Atlas up to Lybia and dry savannahs. In Europe, it lives in rocky areas with steep cliffs, and also on littoral cliffs. 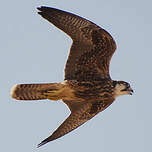 Lanner falcons live in pair but practice group hunting. 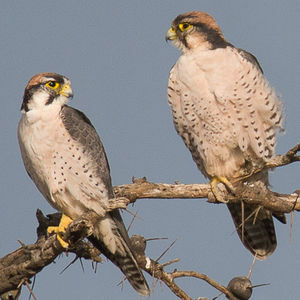 Female acts like a beater and hunts out victims while the male remains a bit behind, ready to swoop down on the prey. 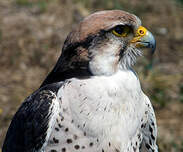 This technique, rather unusual amongst birds of prey, offers this sedentary bird enough food resources for its survival. 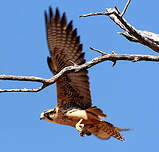 Lanner Falcons are known for their fast and agile way of flying. 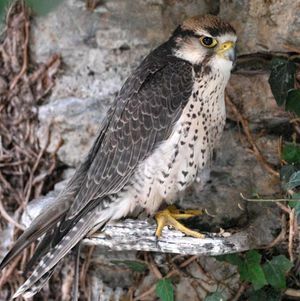 The Lanner Falcon likes open spaces where it has the possibility to track down and hunt mainly birds like pigeons or jackdaws, but also smaller birds of prey like Kestrels and Lesser Kestrels. 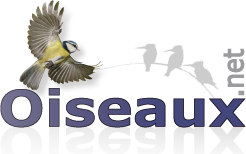 They feed occasionally on small and medium mammals, reptiles and large insects. Normally, Lanner Falcons don't build their nest. They prefer to reuse corvidae's old nests or diurnal birds of prey abandoned eyries, placed on a ledge, a sheer promontory or a tree. Female lays two to five eggs between mid-February and end of March. Both parents sit on alternatively for about 30-35 days. Youngs fledge at about 40 days after hatching. Considered as endangered species in the EEC, where its population doesn't exceed 200 pairs. Unfortunately it happens that eggs are stolen by collectors. This poaching has been very harmful to the conservation of the species in Europe. Another cause of low productivity is disturbance caused to this species during breeding season.